Followers of this blog will recall the much anticipated re-broadcast of Mr. Magoo's Christmas Carol for the special's 50th anniversary in December of 2012 and the unanimous disappointment with NBC's editorial skills, hacking 8 random minutes from the film, rendering it completely incomprehensible. 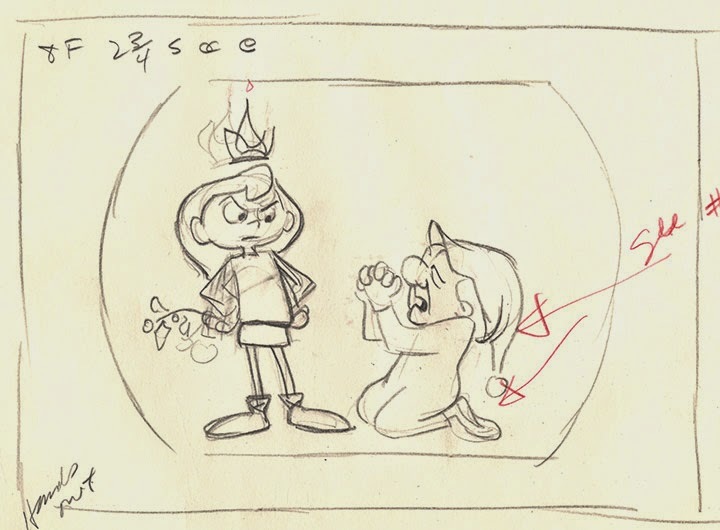 It looked like the first animated Christmas special was doomed to the ash heap of television history, a verdict that seemed sure when the show failed to be broadcast last year. 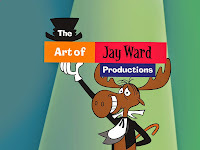 However, I'm told by multiple sources that Mr. Magoo's Christmas Carol will be airing this year, this time on The CW on December 19th, with times variously listed as 7 or 8 PM (check your local listings for station and time). I've also been told that it will run in a 90 minute slot, which should mean it will be complete. Not even the most rapacious advertiser should be able to fill up 38 minutes of airtime in 90 minutes. I can't vouch for the accuracy of the slot/run time so caveat emptor. If true, we can hope that a new generation of TV viewers will rediscover Lee Orgel's special, Styne and Merrill's timeless songs and the sincerity and faithfulness of Barbara Chain's adaptation of Dicken's original novel. The special will also air on The CW on Christmas Eve so you if you miss this Friday, be sure to catch it on the night before Christmas. 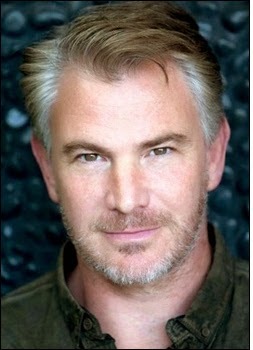 Douglas Sills, who will be performing the role of Magoo/Scrooge. It's been talked about for years, doing a live, theatrical version of Mr. Magoo's Christmas Carol and here's what might be the first step--a benefit concert featuring all the songs from the special sung by current Broadway performers. The event happens December 15th in New York, details can be found here. I understand it's being sponsored by Jule Styne's widow, Margaret Styne, with several other key players laboring behind the scenes for the last 18 months or so to bring it to fruition. If any of you are fortunate enough (or well-off enough) to see it, write in with details. Here's hoping it leads to a full-blown theatrical staging: an animated musical set on the Broadway stage actually being performed on the Broadway stage! 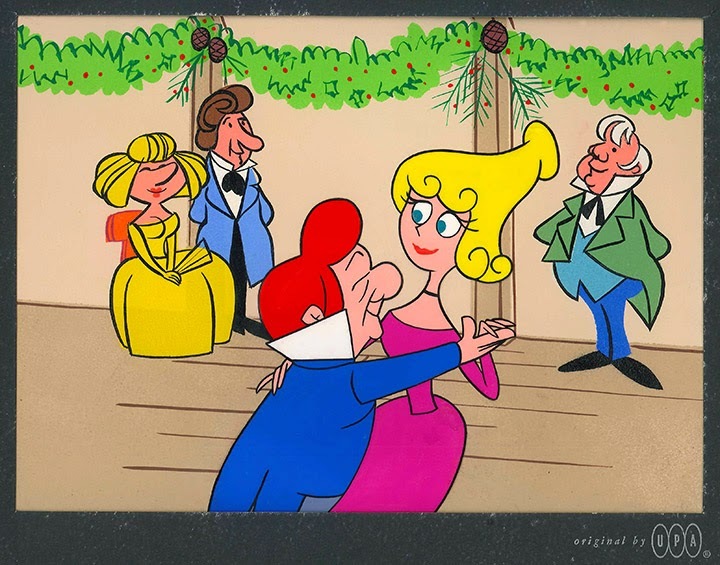 As the Christmas season is upon us, it seems only fitting that I should start out the month of December with a new post sharing some recent discoveries from Mr. Magoo's Christmas Carol. I learned many things researching, writing and publishing three editions of my book on the making of the classic special, but perhaps the most salient thing I learned is that no book is ever complete. When I put together the 50th anniversary edition, I did everything I could to make it the most complete version of the book using new information, artwork and photos. After 5 years with the material, it seemed like anything waiting to be discovered had already been found. And for a couple of years I was right. However, life is never that simple. When Lea Orgel, widow of producer and MMCC creator Lee Orgel, needed to move into an assisted living facility because of declining health, I was asked by her daughter, JoAnn, to help her dig through a lifetime's worth of boxes in Lea's storage unit. We went through all the boxes pertaining to Lee's career in entertainment but found nothing of significance regarding the Christmas special. But the most amazing find was hidden in a letter-sized box, which appeared to contain merely a 2" stack of photos from Lee Orgel's Capitol Theater days, signed 8 x 10s from famous and obscure singers and musicians who performed at the theater. The images were fascinating as a time capsule but also interesting to see well-known performers like Doris Day as they were in the 40s. However, in the middle of that stack of photos were fifteen 4 x 4" photos taken during the song recording session for Mr. Magoo's Christmas Carol! Photos that hadn't been seen since they were taken and had never before been published, photos that I would have loved to have included in the 50th anniversary edition, photos that gave just a tiny bit more insight into that historic day. Jule Styne with Jane Kean, the biggest find in the batch. 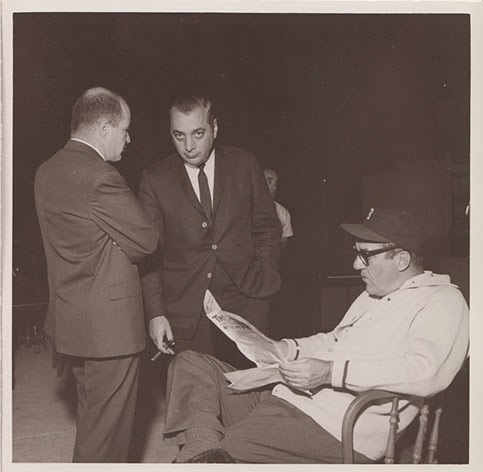 Production manager Earl Jonas talks with Hank Saperstein while Jim Backus reads the trades. 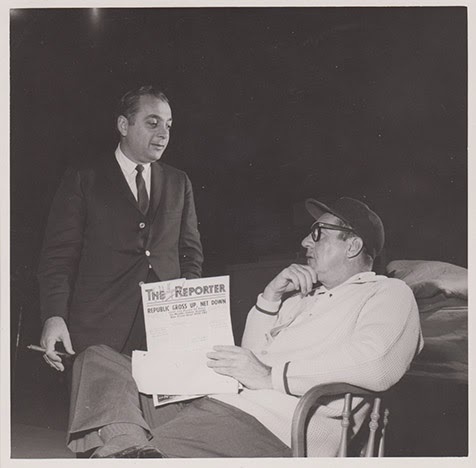 Lee Orgel confers with Jim Backus. 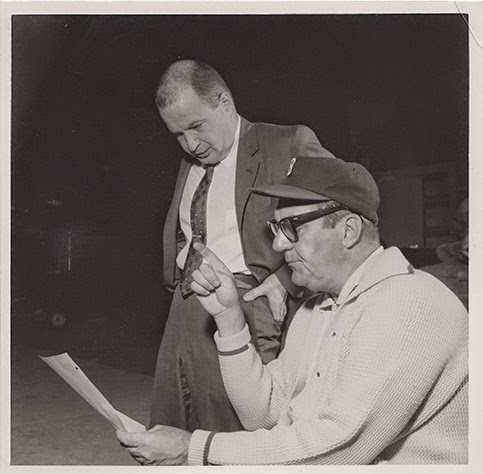 Jim Backus chats with Hank Saperstein. 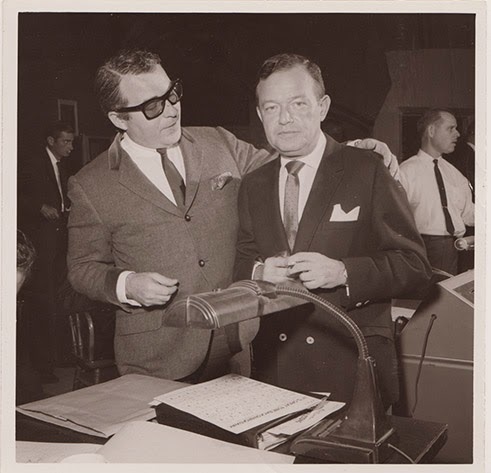 Paul Frees with Jule Styne. In the background are Royal Dano, left, and Earl Jonas, right. Walter Scharf conducts a rehearsal as Backus listens.